Make sure your succulent pot has a drainage hole in the bottom; succulents don’t like having their feet wet. Contrary to gardening intuition, rich and nutritious potting soils are a no-no for succulents. They thrive in porous, sandy soils that allow food, water and air to get to the roots – and water to drain through. Recommendations include sand, small pebbles and vermiculite, or a mix of a low peat planter mix and pumice (50/50), with a top dressing of granite or pea gravel. Warmer months: Most succulents have an active growing period for about 1/3 of a year (the warmest part). During this period, they should be watered once a week. Rather than water in dribs and drabs, wait until the soil is completely dry and then give the plant a good drenching. Once you’ve done this, empty the saucer beneath the pot so that the roots don’t sit in excess water. Cooler months: If there was ever a time for a little unforeseen neglect, this should be it, as succulents go into a dormant phase and generally need water only once a month during winter. When it comes to succulents, too much fertilizer can be worse than none at all. Keep a healthy balance with a low-nitrogen fertilizer at about ½ to ¼ of the recommended rate. If new growth is pale green and elongated, your plant needs more light. If the side of your plant facing the light source is yellow, tan, red or indented, it is getting too much light. 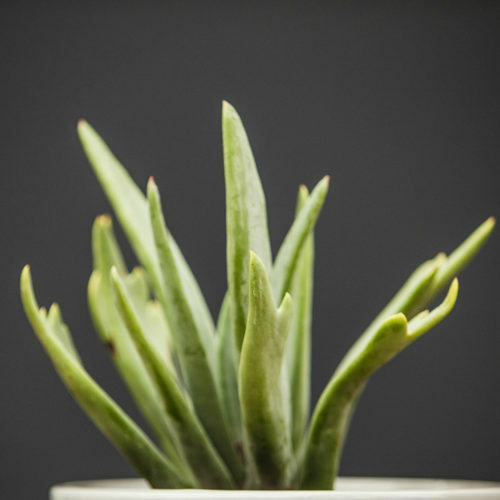 Succulents struggle in stagnant air, so make sure your plants have access to good air circulation.